The GM Building is located at 767 5th Avenue in Manhattan, New York and was completed in 1968. 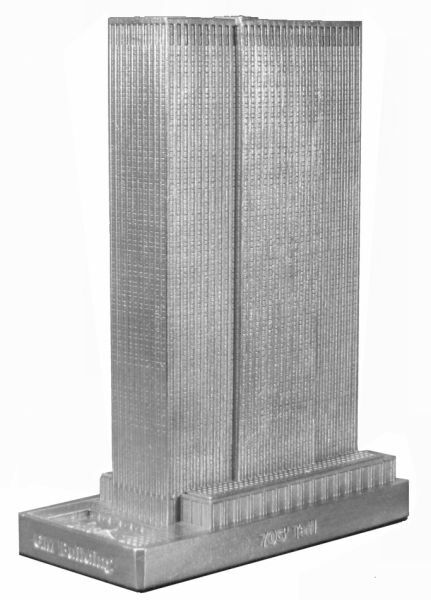 This building was designed by Edward Durell Stone & Associates with Emery Roth & Sons and stands 705 feet tall with 50 floors. This pewter replica stands just less than 5-1/8 inches tall and is finished in new pewter. This model's scale is 1 inch = 150 feet. I wondered if Infocus Tech would produce this GM bldg in NYC and they did! I bought mine in white which looks great! It fits in very well amongst my other NY bldgs.